Barcelona clinched their 19th Spanish league title without kicking a ball after title-rivals Real Madrid lost 3-2 at Villarreal on Saturday. It left Pep Guardiola's side with an unassailable lead ahead of their match at Mallorca on Sunday. 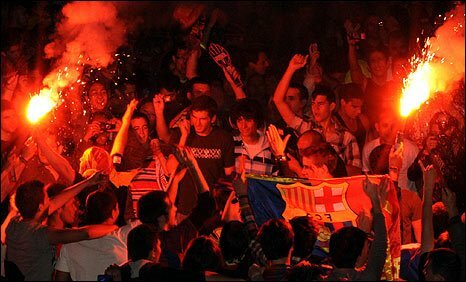 On Wednesday Barcelona won the Copa del Rey when beating Athletic Bilbao 4-1. Barca could become the first Spanish side in history to win the treble if they beat Manchester United in the Champions League final on 27 May. The Catalan club's title triumph was their first in three years and is their first domestic double for 11 seasons. Who is the best club team in the world? Their Copa del Rey victory was the first time they had won the cup since 1998 and was their first piece of silverware in two seasons. Barcelona currently have 86 points and a goal difference of plus 72 with three games left, while Madrid have 78 points with two to play. Their triumph came on the same day that their Champions League rivals United claimed their third successive English Premier League title with a 0-0 draw against Arsenal. The pair meet in Rome with United looking to defend their European title. Barcelona's success this year has vindicated their decision to part company with long-standing coach Frank Rijkaard at the end of last season and appoint former player Guardiola as manager. For 38-year-old Guardiola, a Catalonian by birth, this week's triumphs are his first as manager of the club he spent 11 years playing for.